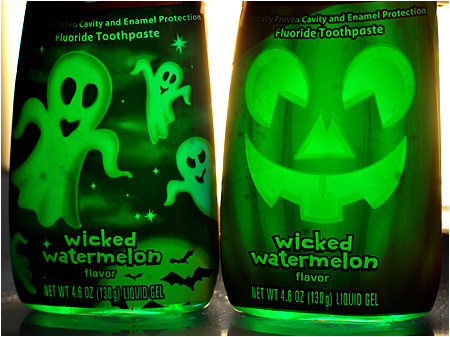 Colgate’s “Wicked Watermelon” Halloween Toothpaste. Plus, A New Contest! It was bound to happen sooner or later, what with products like Halloween Soda and Halloween Tacos coming out in recent years, and now the moment has arrived: Halloween now has a toothpaste. 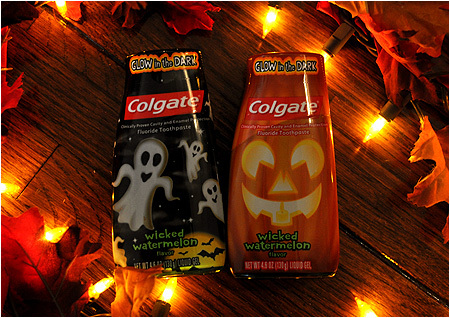 Believe it or not, the Colgate company has just put out a new line of "Wicked Watermelon" flavored Halloween toothpaste that comes in two different glow-in-the-dark seasonal containers. One's a jack-o-lantern, the other has ghosts flying all around it. You know what I think of when picturing wicked things during the Halloween season each year? Watermelons. I mean, who wouldn't, right? Watermelon is just as synonymous with Halloween as peppermint bark is with Labor Day Weekend. Pumpkin spice? Nah! Candy apple? Pfft! Give me watermelon on devil's night, so that I may defend myself by spitting seeds at all the ghouls who try to swallow my soul. More importantly, raise your hand if you associate the refreshing act of brushing your teeth with the flavor of watermelon. Doesn't everybody? The scent of watermelon wickedly overpowers your nostrils the second you pop open the container lid. And the flavor... my god, it is so incredibly strong when the green / turquoise paste hits your taste buds. The only thing I can equate it to is that it must be just like what brushing your teeth with a watermelon Jolly Rancher candy melted down to liquid form would feel like. It just feels wrong... wickedly wrong. It's seriously hard to imagine something that tastes like this is actually cleaning your teeth instead of rotting them away with every stroke of the toothbrush. As you can see, one of these packages lives up to its claims... while the other on the left is a bold-faced liar. I'm looking at you, smiley jack-o-lantern tube of watermelon flavored toothpaste. You're not fooling anybody. I held both of them up against a bright light for a good 60 seconds, and the pumpkin just isn't glowing at all. So either this one is defective, or somebody at Colgate screwed up and was hoping nobody would care enough about Halloween toothpaste to complain. On the plus side, while only one of them actually glows-in-the-dark, both tubes of toothpaste look absolutely fantastic when backlit. 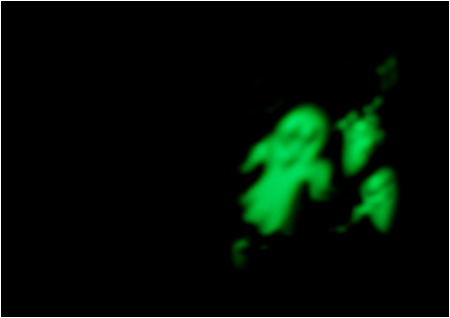 With that eerie green glow, I'm not sure if these are these holding toothpaste, or if they contain liquid Satan just like in my favorite horror movie, John Carpenter's Prince of Darkness. Pray for death! I decided to use the toothpaste to draw a simple jack-o-lantern, but controlling the drip was far more difficult than I had anticipated, and getting the teeth to look decent was damn near impossible. They don't even look like teeth... it just looks like he has some kind of horrible, swollen gum disease. But oral agony aside, it still turned out okay. Now I understand why Pollock made big, beautiful messes on the canvas instead of detailed figures. Speaking of which, has anybody laid claim to be described as the "Pollock of freeform toothpaste art" yet? If not, I'm totally calling dibs on that title. That could be my easy ticket straight to those highfalutin art gallery shows with wine and cheese and people wanting to pay me a bajillion dollars because I decided to splatter some green toothpaste onto a sheet of paper, tack it to a wall, and call it art. Yesiree... that'd be the good life. And the good life would smell like watermelons. ***CONTEST*** It's time to stop brushing your teeth and to start putting toothpaste to good use for a change! 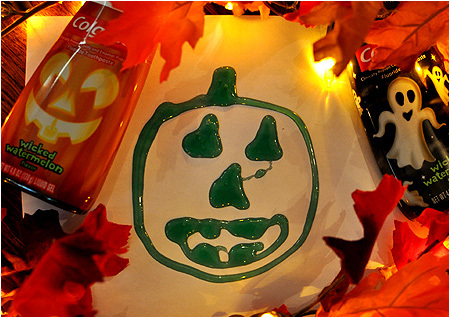 Using whatever varieties of toothpaste you have at your disposal, create some kind of Halloween picture on a sheet of paper. It doesn't matter how bad you think the toothpaste art looks, just make sure it has a Halloween theme of some sort. I'll be judging these solely based on creativity and not your technical skills as a toothpaste artist. Once you've created your piece, take a photo or two of it and send it in .JPG format to me along with your title for the piece. Submit your entries via email to webmaster@i-mockery.com with the subject line "I-Mockery Halloween Toothpaste Art Contest". All entries are due by Sunday, October 7th. All entries will be put on display here on I-Mockery in a special Halloween toothpaste art gallery along with whatever titles you give them. One lucky winner will receive a special Halloween care package from yours truly. You can enter as many times as you like and this contest is open to everybody around the world, just make sure you have your entries turned in no later than Sunday, October 7th. Good luck to all who enter! I'm not gonna lie, this is the single greatest idea I've heard in quite a while. oh boy....this is going to be one awesome contest. can't wait to see how this plays out. question though. Is toothpaste all you can use? or can you stick things to the toothpaste? so.....toothpaste macaroni pictures are ok? Indeed! Think of this as the kind of assignment you'd get if you were still in preschool / elementary school. can i use props from my toys? Go for it. Like I said, anything goes as long as the painted portion is made purely toothpaste. How pornographic can we make these halloween toothpaste drawings? Like how many penises can my pumpkin have before it's too many penises? Obviously, let's try to keep 'em safe for work since I want everybody to be able to view the gallery. The great thing about this contest is that toothpaste comes in so many varieties.. you could use the pasty white kind, the weird green and red striped kind, the transparent gels of various colors.. There's toothpaste all over my bathroom floor now. wait to all the entries, should be great. crafty items, no matter masterpiece will stand out as a minty Monet. My goodness and last week I was staying at some Rotten Hotel in California.I thought about buying white candles. I already have fake blood with me .Right before I left I thought about Drawing a pentagram drawing in blood I should've wrote on the wall. "Are we Possessed yet?" on it.But I don't even have guts to pull such prank . Previous post: The Artwork For “Halloween III: Season Of The Witch” Collector’s Edition Is Awesome. Next post: Some Things I Saw At The 2012 L.A. County Fair. Plus, Ghost World Toys!